JS iStore - functional template from popular developers JoomShaper, working on Joomla 2.5. 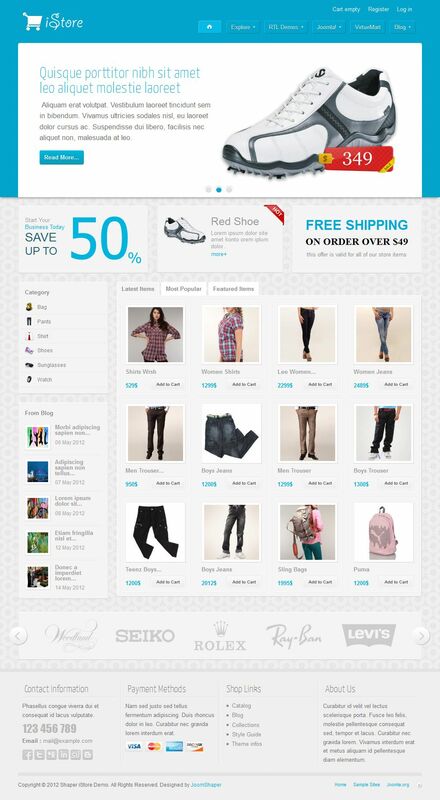 This template works on the powerful and popular e-commerce component VirtueMart. Quality crafted design layout consists of three color schemes (brown, green and blue) and modular design template includes more than 65 module positions which are capable of flexible display products on the site. Proprietary platform Helix Framework provides fast loading pages, optimized code files and supports four types of menu: Mega Menu, Moo Menu, Dropline Menu and Split Menu.